100% Foie Gras Prepared in the French Style! 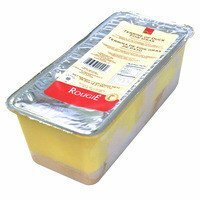 2.2 POUNDS Rougie block of Duck Foie Gras is emulsified foie gras lightly seasoned with Armagnac. Serve chilled but not ice cold on French bread or brioche or with greens. The texture of this product is firm, and is best served sliced. 100% Foie Gras Prepared in the French Style! If you have any questions about this product by Rougie, contact us by completing and submitting the form below. If you are looking for a specif part number, please include it with your message.